The most encouraging sight for any Sunderland fan watching the Black Cats’ latest defeat at Molineux last week won’t have been anything they witnessed on the pitch. Instead it would have been the sight of the twitching, note-taking, nervous new boss Martin O’Neil sat in the stands, flanked by his trusty wingmen Steve Walford and Seamus McDonagh. O’Neill’s eagerness was so plain to see each time Sunderland attacked that many wondered why he hadn’t been immediately thrust into first-team affairs by chairman Ellis Short. 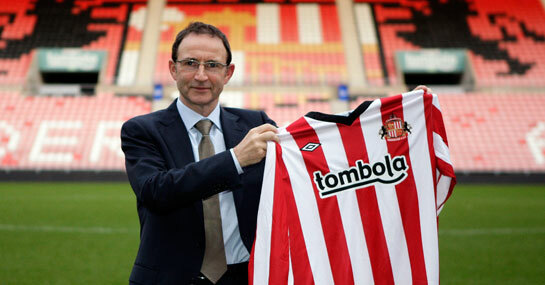 Instead, he makes his Sunderland bow for tomorrow’s home game against Blackburn. After watching his new side squander their 1-0 lead by missing a penalty and then going on to lose the game at Wolves, O’Neill will be under no illusion as to the size of his task. One look at the table and previous results shows that Sunderland aren’t too shabby at the back. Indeed they’ve not lost by more than a single goal all season. Quite simply, Sunderland aren’t scoring enough goals. And training this week with his new squad will have opened O’Neill’s eyes to the bizarre attacking situation his predecessor has left him. So short of options in attack, O’Neill will no doubt have been perplexed to learn that his best striker is plying his trade in the Emirates, and his second best striker is an inconsistent, temperamental character who doesn’t even belong to the club. Sunderland’s season therefore will no doubt hinge on how much O’Neill can get out of his forwards until he gets the chance to bring in a goalscorer in January (or indeed, recall Asamoah Gyan). He’ll expect Bendtner’s form to improve and no doubt ask the Arsenal player to play further up the pitch, though the Dane, 5/1 to score first, remains an injury doubt for tomorrow’s encounter. Connor Wickham is just the type of physcial frontman O’Neill likes, but the youngster remains sidelined, as does Frazier Campbell, so Ji Dong Won (7/1 to score first) should get another chance in attack despite a below-par display last week, with reserve striker Ryan Noble still deemed too raw for first-team action. As for Blackburn, with eight goals in their last three league games, goals don’t seem to be the problem. Instead they’re leaking them at the back, with eight also conceded in the same three games. It all makes an intriguing match-up, particularly with Sunderland now occupying a relegation spot following Wigan’s shock win at West Brom. Sunderland are favourites, at 10/11, but with only two home wins since New Year’s Day, those not bold enough to back a Blackburn win at 3/1 might be tempted with the draw (12/5).